Let your website be the first people see when they search for fishing charters in your area. T-Kat Charters saw a drop in the number of phone calls and bookings and knew he needed to be where people are searching online. So, we set T-Kat Charters up with our SEO program and Voilà now he’s the #1 charter boat in his location. Let’s face it nobody uses Google to view ads. There is a reason why 90% of all clicks go to the organic listings, and Ad-Blocking software use is up over 40%. Paid ads are annoying and hold little trust to the user. People understand the answers they’re looking for are found in the top results of the organic listings. Doesn’t it make sense to get your business listed in the organic results? SEO is the acronym for Search Engine Optimization. SEO is the art and science of getting a website ranked high in Google Search. A successful SEO campaign will give you an uninterrupted stream of qualified traffic. It should come to no surprise when your site is ranked high in Google it comes with a level of trust already associated with your brand. The reasoning is simple. Google does a great job of filtering the results from spammy less trustworthy sites and the association of higher trusted sites. Here is a perfect example of a client of ours, Native Salt Charters. 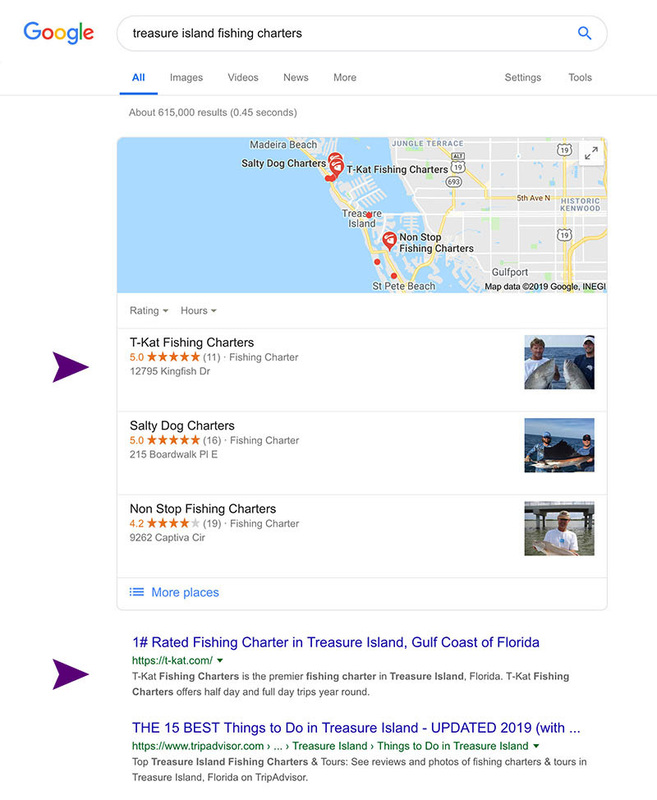 When you search for “Charlotte Harbor Fishing Charters”, Native Salt Charters is ranked #1 and sits above two listings from TripAdvisor, A highly trusted website. Isn’t better having a level of trust already established before clicking on your listing? With the ever-changing environment of SEO, you need a company that stays on top of the latest trends. At Moonshine, we are very active in the SEO community. We are consistently monitoring Google’s (200) ranking factors, patent filings and testing our work so we can stay ahead of the competition. First, we'll schedule a call to talk about your goals and how we can incorporate our SEO program into your business. Next, we get right to work. We have an in-depth understanding of the fishing industry so no time will be wasted learning about it. Start being successful online, make more money, beat your competition and be recognized as one of the best fishing charters in your area. For a limited time, you can save 50% off the regular price. This offer will not last long so don’t miss out on this great opportunity. Choose a payment plan that's right for you. No. Everything is included in the price. You will start to see results as early as two weeks. How long is the SEO program? Six months. You will achieve the results will beforehand, but to ensure they last we extend the service for this length of time. Does this cover more than one location? No, the SEO program is designed for one-location. If you are interested in multiple locations, then contact us. We can create a customized program for you.